There are countless benefits that come with getting fit with a group or a partner. A group or partner will help you stick to your diet, stay focused on your goals, keep you motivated, remind you to keep exercise appointments, and push you to exceed your limits when working out. It is with this insight in mind that Amway formed Team NUTRILITE™. Team NUTRILITE™ members support and inspire each other with the aim of achieving one ultimate goal: OPTIMAL HEALTH. 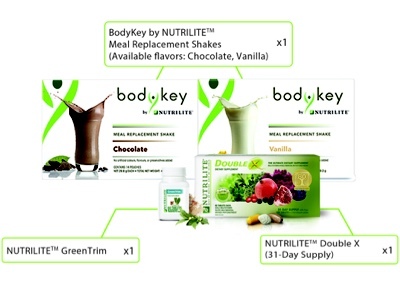 Aside from the advantages of having a growing global support group to help members achieve their health and fitness, joining team NUTRILITE™ comes with exclusive membership perks such as: a PPV point earning system, invitations to special exclusive NUTRILITE™ events, and discounts on NUTRILITE™ products. 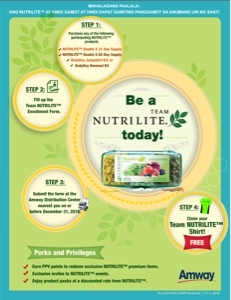 Becoming a Team NUTRILITE™ member is easy. 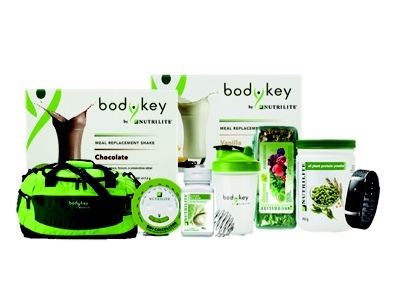 Just purchase any of the following NUTRILITE™ products - NUTRILITE™ Double X 31-Day Supply, NUTRILITE™ Double X 62-Day Supply, BodyKey Jumpstart Kit, or BodyKey Renewal Kit; fill-out the enrolment form and submit to any Amway Distribution Center. All members will automatically get a free Team NUTRILITE™ shirt. Another added treat is that Amway Philippines will be rewarding deserving Team NUTRILITE™ members with round trip tickets to Vietnam. Visit our Amway Philippines Youtube channel at http://bit.ly/1XBlrnE for more information on the Team NUTRILITE™ program and how to win roundtrip tickets to Vietnam. 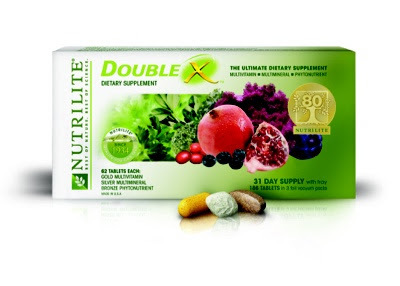 So head on to any Amway Distribution Center and be a Team NUTRILITE™ member today!